D-Log: Things That Make Life Fun! Things That Make Life Fun! Tala is at her friend Hannah's for a sleepover. She left yesterday and will be coming back today. Her room is empty... I found myself checking it out yesterday after I got back from work and first thing when I woke up this morning. Moody misses her--on his own way. He was flipping through the TV channels last night and said that he misses Tala because she would be yelling at him for flipping through the channels! I say he misses the feedback loop and the enjoyment of success at bugging someone! What is it with men/boys and constantly flipping through channels? Hmmm? Some research needs to be done in that area. 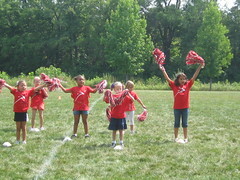 Tala finished her cheerleading camp this week, and Moody is starting sports camp next week. The kids are enjoying their summer which is coming to an end soon... We need to start buying school supplies and not leave it for the last minute like we do every year. By then, we'd have a difficult time finding everything they need. The stores are already stocked up with school supplies. Moody decided he wants to do dance at Generations this year. He refused last year (boy's mentality) but actually missed being part of the recital and all the fun so he decided to join this year. Tala wants to do Step One which is competition dancing. That will require a lot of commitment on her end and I hope she can make it. It will be good for her from the physical activity perspective and also the discipline that comes along with participating in such things. And yes, we are definitely signing Sol up for the Father's Dance this year... he he he that would be lots of fun! Mentioning Sol, he's been in pain for the last 2 days. 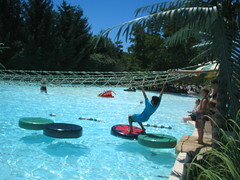 On Thursday, he twisted his back emptying the pool in the yard... Poor old man! And talking about backs, I've been having back pain for a couple of months. I was able to correlate it to the fact that I sit with my legs crossed all the time. I bought me a footrest for the office, and it worked. No back pain till around 5 PM. That reminded me of my days at the bank in Lebanon. My manager, Lamin Shallouf bless his soul, was so generous with his staff. He provided us with all the comforts we need in the office, including footrests, monitor filters, etc. Here, you have to buy your own even a space heater to make your office temperature tolerable in the summer! My nephew, Mido, Nahla's son, had a surgery this week. He got his tonsils removed (I used to call them utensils ha ha ha) and a hernia repaired. Poor little Mido. He's doing well though. When I asked him "What did the doctor do to you?" He said "Ta7leel" (blood work or tests). Oh, and he refers to Tala as the butterfly. After seeing this picture of her, he is convinced that she is a butterfly... fluttering by. I can't agree more... She is my butterfly that eases my worries and pain away! Nahla told me today that my voice and way of talking is exactly like Mom's. It's funny when you're younger, you wish you end up nothing like your mother, but you reach a certain age and it makes you feel good to be told that you look like her or sound like her! I'm compiling my bucket list--in my head. I need to write it down and start implementing it and crossing things off. Oh, the other day, Moody woke up, came downstairs to the kitchen, said good morning to me and then added, "Mom, you know how people have a will?" At first, I thought he meant well. When I asked him what about it. He said, "You know they write the will so when they die people will know what to do with their things. Are you going to write a will?" Pure, innocent, practical... That's my boy! lol I told him that I was actually talking about it to Sol the other day and told him that I need to write a will... I will, very soon. 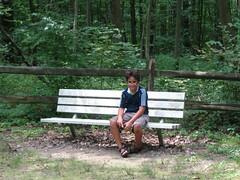 Last weekend was hot and humid. I managed to convince the gang to go for a hike in Sharon Woods. We did. 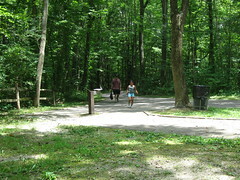 We four walked the outer 4-mile trail, about 6.5 km. We were all sweaty and hot, but it felt so so good! Wrapped it up with cold showers and watermelon. I submitted a short-term disability claim yesterday at work. I'm going back under intense chemo for 3 days every 2 weeks for about 8 weeks. So I'll be taking those 3 days off from work. Some people tell me that I should quit my job and just enjoy life. I find it hard to explain that I love my job, it's part of my life and it makes me feel good. I stepped out the front door first thing this morning to check out my flowers--a daily ritual. I was greeted by a flock of birds moving between the cherry tree by the house and the tree in the middle of the front yard and chirping away! It was a delightful sound... a delightful good-morning wish! 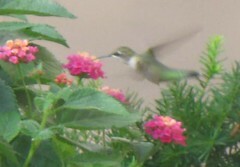 Here's a picture of a huming bird I caught the other day hovering over the flowers. We'd seen it more than once around the same flower plant. So beautiful! I miss my parents, my sisters, and my brothers... I really really want to see them and be with them again! Spring, Summer, Science and... Gender!